Critiques Invited for an "In Memoriam" poster. Now so a kneeboarder rides on his knees. 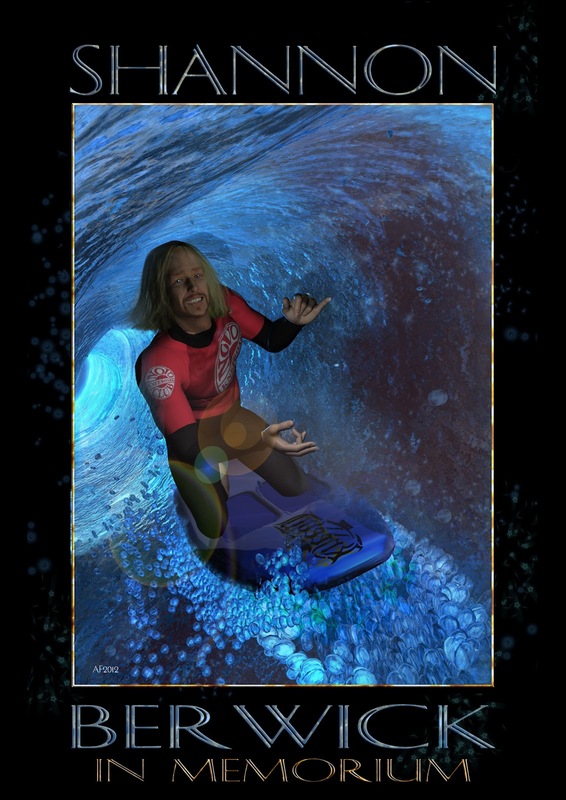 The image is supposed to be of Shannon in the 'barrel'. His left hand is doing "Hang Loose". And any well meaning critiques are welcome. Thanks for looking! PS: The above links take you to big files. Honestly, I like the composition of the first one. I do agree that hiding the face also could look better. Could you turn the head so he's looking back over his shoulder and adjust the hair so that it appears to be blowing across the camera side of his face? Of the two, I prefer the top image. I like the look in his eye, a twinkle that sort of says, "I'm havin' fun. What are you doing?" The look on his face and the eyes are just priceless. And for its purpose, remembering a friend, I'd say it's spot on. The second image seems more awkward, to me. That may only be because I saw the first image...well, first, so it may not be a fair comparison. Also, the shadow at the bottom of the second image doesn't seem quite right. It gives the feel of the figure floating above the water. You should be able to fix the neck strangeness in post with the warp brush/liquify tool (depending on your software). That's my go to tool for just about anything. You might also consider applying just a bit of gaussian blur to the entire image. A very tiny bit like 2 or 5. I feel like that would soften the image and blend it all together a bit more. It would also give the bubbles and such a softer, more natural look. I've never been great with fonts, but I like what you have. I also think the bubbles moving out of the frame is a nice touch. All in all, it comes down to the look in his eyes in the first image. You've captures something there. His smile makes me smile. I almost can't help it. If it were me, that's the one I'd want to see to remember a friend. Thanks very much Evil producer. Yes the first one has the advantage of getting where cameras don't normally go. It's a good idea of turning the face and the hair thankyou. I also thought of silhoetting and did a few - but it was too forlorn and foreboding - and it took all of the joy from the image. Of the two, I prefer the top image. I like the look in his eye, a twinkle that sort of says, “I’m havin’ fun. What are you doing?” The look on his face and the eyes are just priceless. And for its purpose, remembering a friend, I’d say it’s spot on. Thanks Booksbydavid! Yes he has a twinkle in his eye. Just like in real life. The second image seems more awkward, to me. That may only be because I saw the first image…well, first, so it may not be a fair comparison. Also, the shadow at the bottom of the second image doesn’t seem quite right. It gives the feel of the figure floating above the water. That's a good point thankyou. Yes the shadow is weird. I had trouble positioning the figure because the wave comes up transparent in the assembly room. So maybe he really is floating. I'll have a go at fixing that! You should be able to fix the neck strangeness in post with the warp brush/liquify tool (depending on your software). That’s my go to tool for just about anything. Ahh thanks for that hint. I nromally go clone tool, but I will certainly give that a try! I’ve never been great with fonts, but I like what you have. I also think the bubbles moving out of the frame is a nice touch. All in all, it comes down to the look in his eyes in the first image. You’ve captures something there. His smile makes me smile. I almost can’t help it. If it were me, that’s the one I’d want to see to remember a friend. Thanks Booksbydavid. I really appreciate the input! I'llpost something when I get a bit more render time. I'm impressed with it as it is. But if anything, I think maybe the nose could use a small bit of work if you trying for a perfect likeness. Head Wax, if the transparency in the Assembly room is causing issues, you can turn it off in the interactive renderer. It's the little Up arrow with a circle around it at the top of the window. Changes made there do not interfere with the render room settings. He looks like a great guy & friend.....I can imagine he will be sorely missed by many. I'm sure he's impressed with your work, too. I'm a body boarder, so the scene is really exciting and makes me want to go out. Get some good ones for him (and me), mate. His hair is dry.....should be wet (doubt even he could get into that tube without getting wet). And would take off the specular on his fingers.......looks plastic....did you apply some SSS? Jeez, I wish I'd known him! You know, I am so impresssed byhow observant you are. When I was pulling the mesh around I forgot all about the nose! Thanks for pointing that out! Head Wax, if the transparency in the Assembly room is causing issues, you can turn it off in the interactive renderer. It’s the little Up arrow with a circle around it at the top of the window. Changes made there do not interfere with the render room settings. Thanks for the heads up on that! Otherwise I might have found that half a BMP in the temp folder? Hey megacal. :) A surfer :) Ah yes, the shinyness on the fingers was my attempt at wetness - but the fingers do look like store mannequins! That worried me! 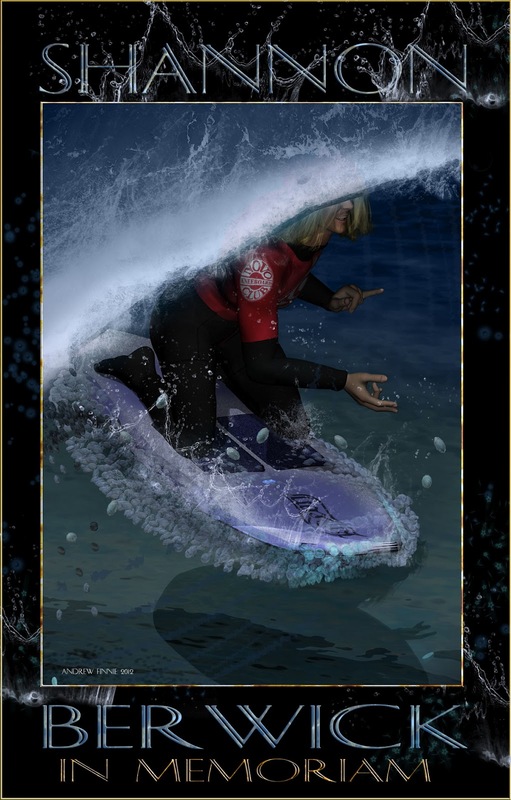 And of course you are right about the hair :) Though of course I never get my hair wet till the third wave! Heh, oh I left Shannon's hair dry cause we only ever saw him with a cap on - with wet hair- or without the cap with dry hair! But you are right, I will have a play slicking it down a little! I'll post those updates when my comp stops crashing! Thanks for your critique - very much appreciated. Any links to videos or stills of Shannon we can see? Would love to see him on a wave. a bit.....think there should be more transmitted light....(?). bright, but it shows the sunlight well. One site that does have is a commercial photo site but you have to join up and login etc. Thanks for the links Head Wax......I registered at KSUSA but haven't been "activated" by the admin yet, so can't login. But will check out all the links. transparency to the wave and putting the light outside? Or using AnythingGlows? critical.......it's the overall image that grabbed me. Nice modeling & shading of the wave, btw. you think of him, especially when you're shooting a clean tube, and whooping it up. Very good. Great idea about the anything glows. I have been making the wave the anything glows and it gives really far out results - concentrated in the barrel. I discovered osmething today that I can stretch out the Cellular and Noise functions in the Transform section of their shader parameters and this might solve the problems I am having getting the ribs in the waves ! Love to see what you could do with rendering a wave by the way. glass, crystals, fluids, etc in 3D, but haven't done a wave yet. Carrara, and it's just not a good modeler for me. Oh the wave is easier if you start with a cylinder and delete the ends and some of the verticies, then use the soft select tool and pull it around a bit. The other way is in the spline modelling room. When I used anim8or I used extruded splines because I was trying to animate them and that meant I could have different cross sections (via making morph targets from extruded splines) and still have the same number of vertices. Except it doesn't seem to work so well in Carrara because when you translate the spline to a vertex model (The idea is still to make morph targets in the spline room that you can use on a vertex mesh) the vertex mesh ends up with different meshworks of polys (depending on the shape of the original spline) - that don't translate into morph targets very well. But I'm sure the advantage of a spline room wave is that you could taper the thickness of the wave at the lip - where is if you just add thickness yto a vertex model it is the same thickness added all over the wave (wall and lip) and that needs more work to clear up. That said you can animate a spline but I have not had much success yet. I hope that makes sense. Thanks for that Ron Romanovsky link. He is a legend that rocks! Here some extruded splines animated with anim8or in 2007. Pretty bad but you can see they have potential. All the waves are morph targets. Love those square rails on the board. It was the first thing I ever modelled. builds and then tubes....very cool! would like to have it on a T-shirt to remember him by. and then over in the right hand box thingy where it says Model select the " Smooth" button in the subdivsion box and then choose 3 in the render slider (If I slide it to six Carrara crashes. ah yes I'd like a t shirt when it is done! couldn't find a tut on making a building/breaking wave. Modeling and rendering this kind of wave would be a great challenge.....it is for me! you could have a 'greenback' moving along suddenly strike a hidden cylinder half it's height ? Carrara will some day soon. ps- this is a good modeling excercise for me, especially to learn to do some modeling in Carrara. Don't know why I've resisted it so long.....may even get to like it. Hah that's funny! Blender looks great actually. If only it didn't have any interface at all it would be easier to use. I've had three starts on it. Threeis enough because life is too short to learn blender. As a good exercise the wave is good. Have you done the Joan of Arc tutorial? It's really good for learning a modelling program. Carrara modelling for me just lacks a knife tool, where you can cut a mesh and where the cut goes through a poly you get and edge joining the edges you cut. It makes box modelling super easy. You just start off with a box and make the cuts where you need more polys and edges. It means you don;'t have to plane your work so well in advance. I’ve had three starts on it. Threeis enough because life is too short to learn blender. Gah sorry Cal I didn't see this reply :( Daz has decided to unsubscribe me from the thread ? I had a play the other day and painted the mesh with blacksmith 3d paint rather than use procedurals. To model the mesh try this. In vertex room drop in a cylinder hit the plus key till it has enough verticie to look round. Turn the mesh so it is horizontal. Look at it from the front . Select the middle polys all the way round and use soft select and the scale toool to squah it in the middle. Go to bottom biew and select the very bottom line of edge using the between selection thingy. Then extrude these edges a few times to make the ocean. Shape the lip by moving the verticies around. Sorry that sounds all garbled without images!! If you have a go at painting a texture map it this is what I found. You need a reflection map because thw white water should have no reflection where as the green stuff will want a lot. Also a transmap is handy to feather the lip but you don't want the white water to be transparent but you want the green wall etc to be transparent. Also a bump map cause the bump in the what water is different to the green stuff. I ran into trouble because I couldn't get transparency and alpha to work together because as soon as I turn on transparancy my alpha map in the alpha channel shows black splotches - weird. There might be a small argument for a slight glow on the white water - to get that luminance. All in all painting the green water (wall etc) gave really good results but I havn't been able to get good white water yet. I'll post in a few days. I had good news the other day and may have an agent so I am getting other stuff ready. Looking forward to seeing what you come up with.!! No problem. Just trying to help. I've been working on animating it, or at least the incoming swell. (unless we pick it up). at least 2 tuts that helped me get started. .This is the latest try......everything set to 100% except Pressure = 0. This may have been done before, but didn't see one.....hope others will try to improve on it. I think I can get it to break by changing the shape of the cylinder towards the end. An interesting video about the waves made for "Surf's Up" and Siggraph.